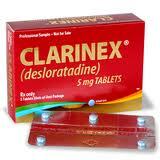 Xyzal and Clarinex are both anti-histamines used to treat allergies. Both medications are now available as generics by prescription since December 2010. The active ingredient for both xyzal and clarinex are the active stereoisomer of the over-the-counter zyrtec and claritin respectively. In other words, zyrtec and claritin available over-the-counter contain the same active ingredient found in xyzal and clarinex, but in an "un-purified" state. Still confused? Read this article which probably contains more information than you ever wanted on this subject.